We offer hospitality, courses, lectures, publications, celebrations and experiences, all of which enhance and promote the monastic way of living in different ways. Reaching out to people of faith and no faith, we work to build a greater appreciation of the monastic way of life. We want to help others acquire practical skills, consider vocation in her many forms, reflect on the meaning of life and discover new forms of spiritual expression in a world of growing diversity. We aim to support the Benedictine way of life and to live with ‘all others’ on this planet, to respect and to work with our differences as well as our similarities. The mission of the Benedictine Institute is to people of the Christian communion of whatever denomination or loyalty. 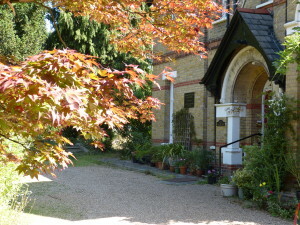 We are also developing another ‘face’ of Ealing Abbey’s service, called ‘London Spring’ whose mission focusses on exploring practical skills, finding the meaning of life and reaching out to people of all faiths and none. The mission of London Spring focussed more on Interfaith, No-Faith, Human Sciences and Social action in order to “make the world a better place”. St Benedict calls his monastery a ‘school for the Lord’s service’, where those who enter are invited to seek God and His will in Community. Our aim is for the Benedictine Institute to reflect the values of the monastery. We are not a ‘club’ for people interested in self improvement, but we work and reflect together and hope to have a “ripple effect” on others. Like any vocational way of living, the monastic life is a journey of growth and response to God’s initiative. Monks live a common life, separated from the distractions of the outside world. Our life focused in the enclosure fosters the careful listening that we need in order to seek God, allowing God to speak to us and for us to hear. In the Benedictine Institute staff, faculty, co-workers and visitors can share in many aspects of the monastic way of life . Our daily lives need balance and structure. In his Rule, St Benedict teaches his sisters and brothers how to achieve this in the monastery, with the help of God. Everything is held in common. We eat, worship and work together as much as is reasonably possible. Each one of tries to be mindful of and obedient to the other. All have individual gifts to contribute to the communal life. In this atmosphere of mutual love and understanding, we hope to be transformed by God’s grace into the image of Christ. We aim to live in the world as a new creation.